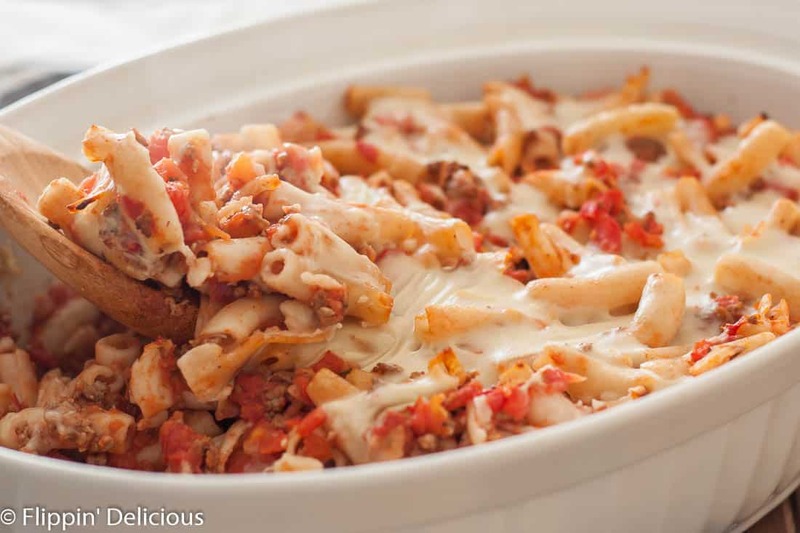 This dairy free gluten free baked ziti is an easy casserole the whole family can enjoy! My family went dairy free the first part of this year when we discovered that my hubby is lactose intolerant and that my toddler has leaky gut and can’t handle dairy proteins; it threw a wrench in my dinner routine. I LOVE (and relied on) lots of recipes covered in ooey gooey cheese like my easy gluten free lasagna casserole and gluten free chicken cordon bleu casserole. 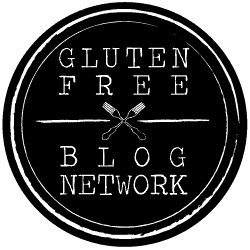 There are a lot of good dairy free and vegan cheese substitutes available, but my hubby doesn’t like them (he is really picky, I like them!) and they are also a lot more expensive. Cutting dairy out of our diet left me in a dinner rut because many of the dishes our family would enjoy for dinner just aren’t as good without the dairy and cheese. 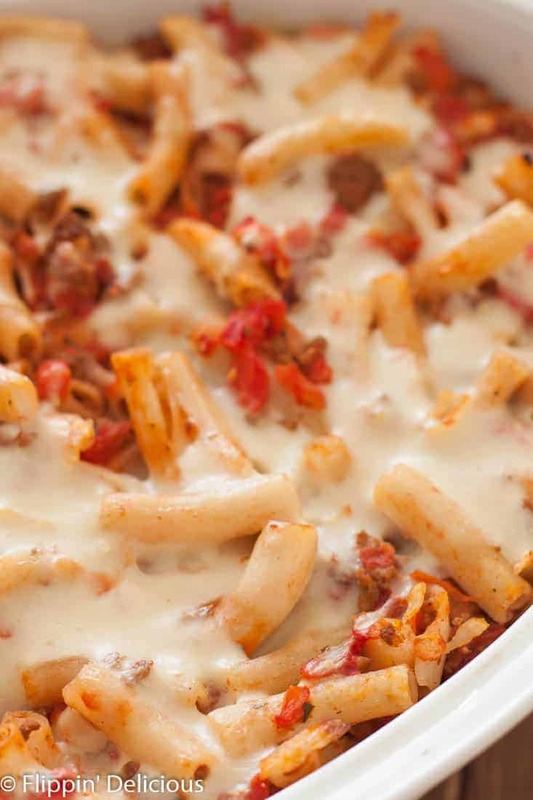 Baked ziti is a classic Italian dish. It is quite easy to make gluten free, with all of the great gluten free pasta that is readily available now. But it really needs a creamy element to replace the melted cheese if you are making it dairy free. I wanted to re-create this classic dish into a dairy free gluten free baked ziti so that my entire family could enjoy it. I didn’t want to rely on more expensive dairy-free vegan cheese, but I wanted to still have the creamy texture. I decided to make an easy dairy free is a creamy parmesan-style sauce! 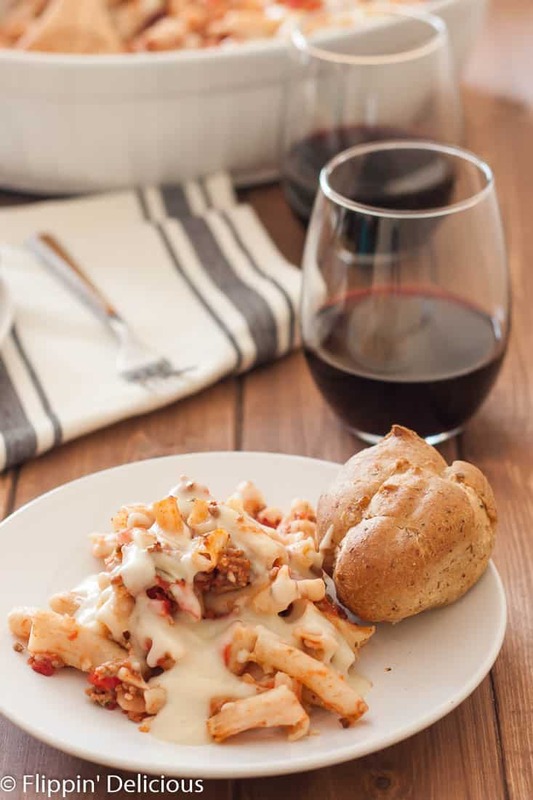 It takes about 10 minutes to make, but you can start it after you already have the dairy free gluten free baked ziti casserole in the oven. I used some cornstarch (or rice flour) cooked in a little oil to thicken some dairy-free milk (I used cashew milk because it is super creamy) and I seasoned it with garlic, onion powder, and some nutritional yeast flakes. Nutritional yeast flakes are easily found at a health or natural foods store. They add a “cheesy” taste that is reminiscent of parmesan in this dairy free cream sauce. Armed with a dairy free parmesan-style cream sauce I was ready to tackle this dairy free gluten free baked ziti recipe. I par-cooked some gluten free penne and tossed it with ground beef and a chunky tomato sauce. I made a quick homemade chunky tomato sauce but you could easily substitute and dairy-free jarred tomato sauce (3-4 cups.) I poured it into a greased baking dish and then let it bake just long enough to heat through and for the edges to get that chew that I love. I drizzled the creamy dairy free parmesan-style sauce on top and then I put the dairy free gluten free baked ziti under the broiler to get bubbly. The sauce won’t brown like cheese will, but the pasta poking through the crust got the chewy baked ziti texture I was going for. I only poured about half the sauce onto my casserole, and served the rest on the side so that everyone could add as much as they wanted to their serving. You can pour all the sauce over the baked ziti, or half, or just serve the baked ziti with the parmesan-style sauce on the side. I think it really is just your personal preference. 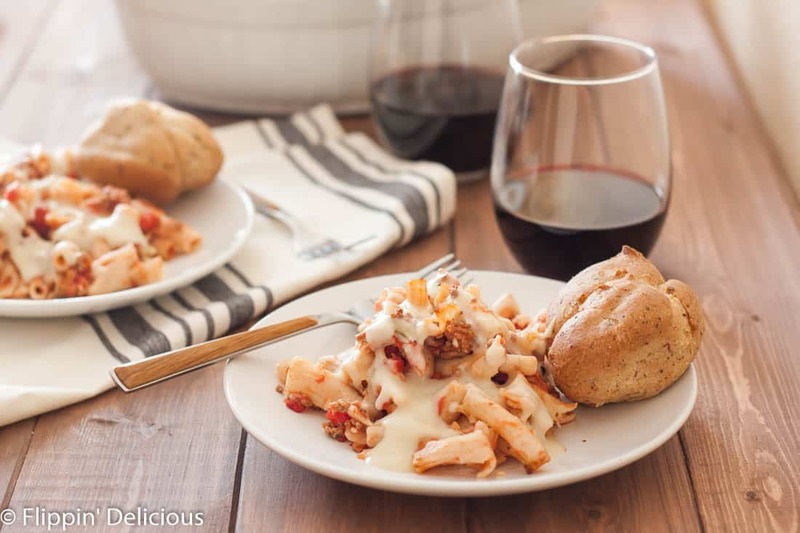 My hubby devoured this dairy free gluten free baked ziti and gave it rave reviews! The parmesan-style cream sauce did just what I hoped that it would, adding a smooth and creamy texture to every bite. I didn’t miss the dairy (or the gluten) at all! I have made this recipe a number of times for my GF/DF daughter. I use jarred sauce to make it quicker (Rao’s), but one of these times I will use your sauce – I’m sure it’s better. My daughter loves when I make this. Just enough creaminess and cheesiness to make her think it’s a ‘normal’ meal. I love the cream sauce on just about anything – I put it on a baked potato last night – yum! Thank you so much for sharing it!! 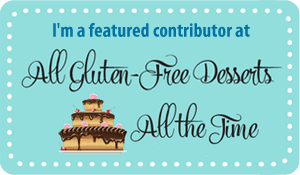 Hi Deb, I am so happy this recipe has been able to help you and your daughter! This was delicious! Thank you. I love baked ziti and was sad I couldn’t have it anymore due to having to be both dairy and gluten free. Thanks for this recipe. I loved it.